What Started It? Bruno Rubinksi's AP Royal Oak! Someone over at TimeZone’s AP forum asked the following simple question: Which AP started it for you? My answer needed some extra work, as Audemars Piguet’s 1998 catalogue (simply called #1, as part of a trilogy of catalogues) says it all for me. 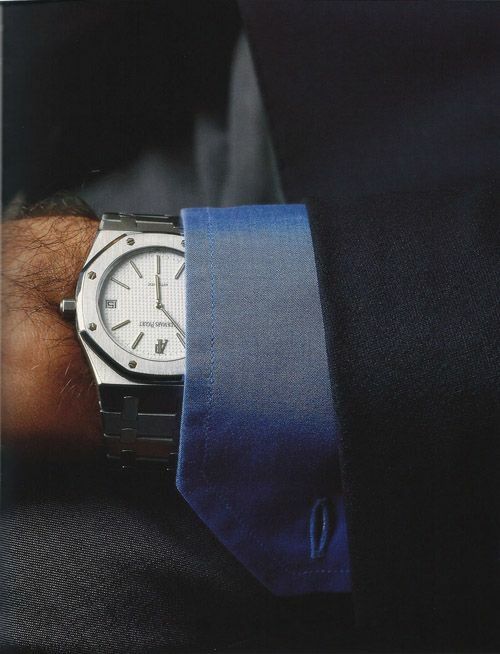 AP asked fashion entrepreneur Bruno Rubinski why he chose the AP Royal Oak (‘Jumbo’) and printed that in their catalogue. Now, there is no sponsoring story or sleek copy-write article in there, just Bruno Rubinski explaining why he loves that watch and that he bought it pre-owned and in a poor condition. To me, the story sounded quite authentic (although I assume at least someone reviewed it ; – ) ) and I think AP showed a lot of guts printing it in their catalogue. It is at least something different from ambassadors promoting a watch they got for free. Below is a picture of his (now rare) ref.14802 or 15002, I am not sure about that. Both are rare finds these days though. This is the AP that started it for me, the Royal Oak. Some hate it (actually a lot of people), some grow towards it and only few call it love at first sight. I belong to the last category I’m afraid. Anyway, I scanned the four pages from AP’s #1 catalogue and posted them in the thread over at TimeZone. You can click here for all the scans in a higher resolution.